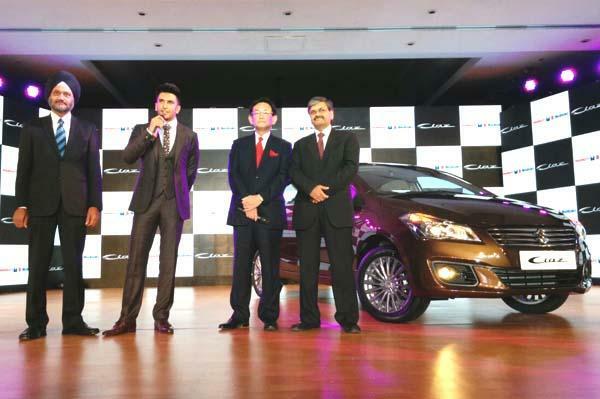 Maruti just launched a newbie in India in the context of mid-size sedan – the all new Ciaz! Priced the new possession of its repertoire, Maruti claimed of bringing the Ciaz’s petrol version to showrooms for Rs 6.99 lakh, and diesel at Rs 8.04 lakh (ex-Delhi). Underneath the bonnet, lays options of a 1.3L Fiat’s Multijet diesel 89bhp/200Nm and 1.4L petrol 91bhp/130Nm. Both of them are mated to a five-speed manual gearbox for the stock vehicle, while petrol trim also gets an option of four-speed automatic for an additional amount. However, Maruti’s new sedan comes packed with projector headlamps and 16-inch alloys on exteriors. Inside the cabin, it gets the touchscreen infotainment system which doubles up as a display for rear view camera, leather upholstery and seats, keyless entry, climate control and many more for the top-end buyers. Amongst the range, standard features are: electrically adjustable wing mirrors, audio system, keyless entry and projector headlamps. Its rival in the market will be Hyundai Verna, Volkswagen Vento, Honda City and Skoda Rapid. Hence, this is not the first time Maruti is going to place its car in the segment above Rs 10 lakh. Earlier attempts of SX4 and Baleno delivered not so impressive outputs, so the automaker seemed in jeopardy this time as well because of the said. Color options for Ciaz: Dignity Brown, Midnight Black, Sangria Red, Snow white, Clear Beige, Silky Silver and Glistening Grey.